It looks like e-retail major is in a major reconstruction mode of late. From hiring ex-Yahoo key personnel Eric Lange and starting off the seller’s advantage week, the hot news this hour is Flipkart debuting the online ticketing business in partnership with MakyMyTrip. Known that the Online Travel Agents (OTA) are currently basking in decent profits and huge volumes, Flipkart wants to dive in and see how much profit it can fetch out of it. Statistics say that the Indian e-commerce industry revenue is generated predominantly by online travel bookings. MakeMyTrip, Yatra and Cleartrip have been hogging big shares in this industry while MakeMyTrip is the current market leader. Airline bookings dominate the e-commerce travel market with half of OTA’s revenue generated by airline bookings. Travel bookings, utility payments, mobile recharges and mobile wallets form a big chunk of online e-commerce revenue so it only makes sense when the biggest retailer and biggest travel agent join hands. Amazon, in March signed a two year deal with the IRCTC for being the railway ticket platform knowing that Indian population travel on trains more often than airlines. However in case of Flipkart, the big e-tailer wants to make it’s portal a shopping mall. Flipkart is not the only one looking to integrate it’s services with acquisitions. Snapdeal too bought online Mobile recharge platform Freecharge to integrate it’s existing services with Freecharge’s mobile recharge, bill payment services and many more. 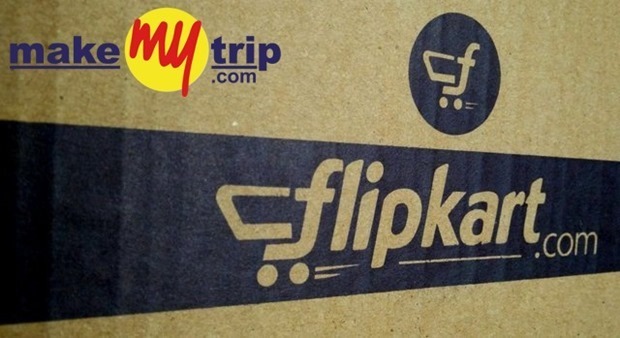 Sources say that Flipkart is likely to launch the travel online ticket booking services in September this year. It’s about this time that Flipkart will hit the mobile screens solely bidding adieu to their website. Flipkart hopes that this new merger of services with MakeMyTrip will turn into a cash cow soon. But it’s surely a promising move as the OTA’s traffic has not once gone down; now with Flipkart partnering with MakeMyTrip might prove to be a well-balanced equation. Though this is a great deal for Flipkart, for MakeMyTrip that may mean eating into a large share of profits, would it mind Flipkart enjoying a little share of it? This September, we’ll know. Who said OTAs are making money ? MMT is in loss since last 8 quarters. From where did you get your facts ?